The 1906 University of Florida Record predicted, "It may take a hundred years for the completion of these plans, but as the State grows…, the University will finally grow into a splendid and harmonious whole…." As one who has a deep interest in history and is a long-term University of Florida employee, it was only natural for me to try to contrast in photos the UF of today with the UF of yesterday. The UF, Then & Now photo project presents a unique opportunity to bring the past and present together in a way that serves to remind us of UF's own heritage and the many who have gone before us as students, staff and educators at this fine institution. Some of these photos presented quite a challenge. The University Auditorium, for example, has been added to extensively in the front and on both sides and Ben Hill Griffin Stadium/Florida Field has seen many additions since it was first built in 1930. My favorite photos are of Sledd Hall, which still has a 'Trunk Delivery' window where student's trunks were dropped off and placed on a dumb waiter to be lowered to the basement for storage, and the students exiting Florida Gym after a memorial service for John F. Kennedy, a historic moment in time. Overall, though interior renovations have occurred, most building exteriors have not changed. The experience was quite rewarding and reminded me that the foundation of what has made this University a leading academic institution still exists in its people and buildings. Abstract also by Pam Marlin. 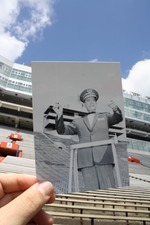 (Caption) Then: Dr. Richard Bowles, professor of music at UF for 27 years, directs the band on Florida Field in 1962. Now: A much larger press box. Dr. Bowles died in December of 2009 at the age of 91.